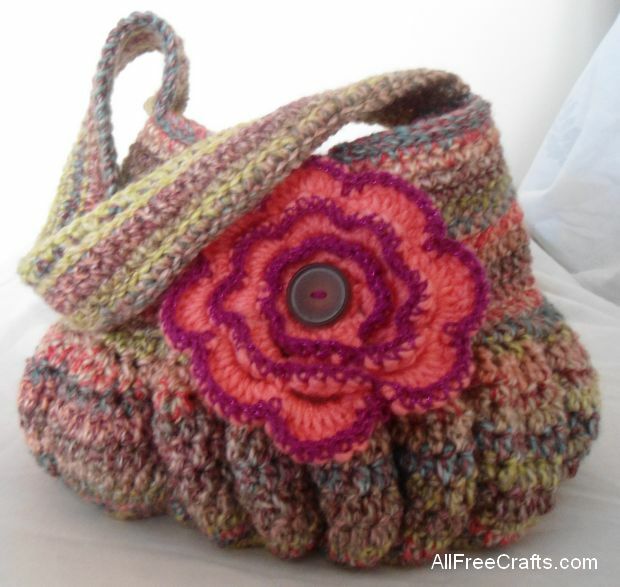 This crocheted hobo bag is roomy and practical with lots of feminine flair. Plump, rounded ripples along the bottom soften the style while also expanding the base. The optional crocheted flower can be used to repeat and emphasize favorite colors from a variegated yarn, or to add a contrasting note. 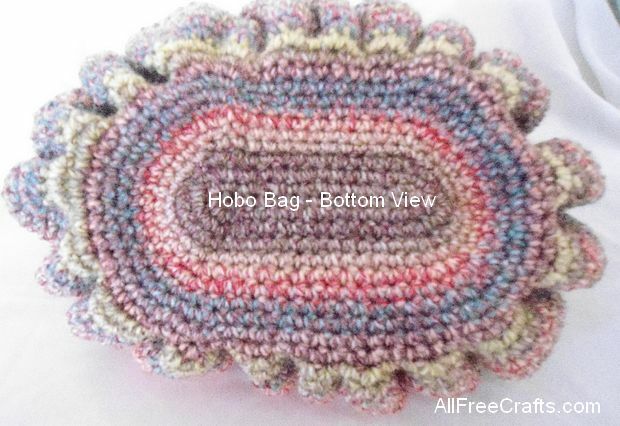 Crocheted hobo bag: lots of room and feminine styling. Beginning in rounds, without joining, place a stitch marker on first stitch of round. 2sc in first stitch , sc in next stitch , 2sc in next stitch , sc in next 12 stitches, 2sc in next stitch, sc in next stitch, 2sc in next stitch, sc in next 12 stitches. 2sc each in next 2 stitches, sc in next 2 stitches, 2sc each in next 2 stitches, sc in next 12 stitches, 2sc each in next 2 sc, sc in next 2 sc, 2sc each in next 2sc, sc in next 12 stitches. 2sc each in next 2 stitches, sc in next 6 stitches, 2sc each in next 2 stitches,sc in next 12 stitches, 2sc each in next 2 stitches, sc in next 6 stitches, 2sc each in next 2 stitches, sc in next 12 stitches. 2sc each in next 2 stitches, sc in next 10 stitches , sc 2 each in next 2sc stitches, sc in next 12 stitches, 2sc each in next 2sc stiches, sc in next 10 stitches, 2sc each in next 2 stitches, sc in next 12 stitches. 2sc each in next stitches, sc in next 14 stitches, 2sc each in next 2sc stitches, sc next 12 stitches,2sc each in next 2 stitches, sc in next 14 stitches, 2sc each in next 2 stitches, sc in next 12 stitches. 2sc each in next 2 stitches, sc in next 18 stitches,2sc each in next 2 stitches, sc in next 12 stitches,2sc each in next 2 stitches, sc in next 18 stitches,2sc each in next 2 stitches, sc in next 12 stitches. You should have 78 stitches at end of Round 6. 2sc in each stitches around; should have 156 stitches. Bottom view of hobo bag. 2sc in each stitch around; should have 312 stitches. This will give the ripple effect on the bottom part of purse. sc2tog back at 156 stitches. sc around slip stitch to first stitch, fasten off sew in ends. Working in rows, chain 71, starting 2nd chain from hook, sc 70 stitches across make a turning chain, sc 3 more rows. Fasten off and sew strap to the center of each side of the purse. Notes: To reinforce strap I slipped stitched along side of purse and sc along the strap edge; I did this on both sides. 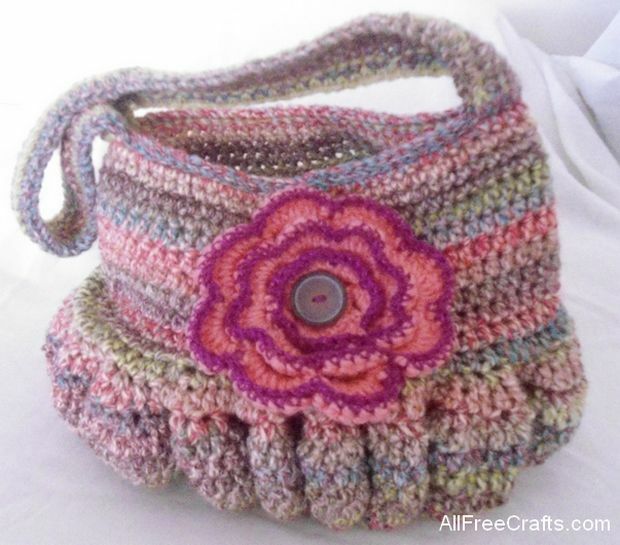 Use any crocheted flower style you may like to embellish the purse. Variation: As well as chunky yarn, I also tried this free crochet hobo bag pattern with the same hook size, but using two strands of worsted weight yarn in two different colors. It worked out well – so don’t be afraid to experiment!